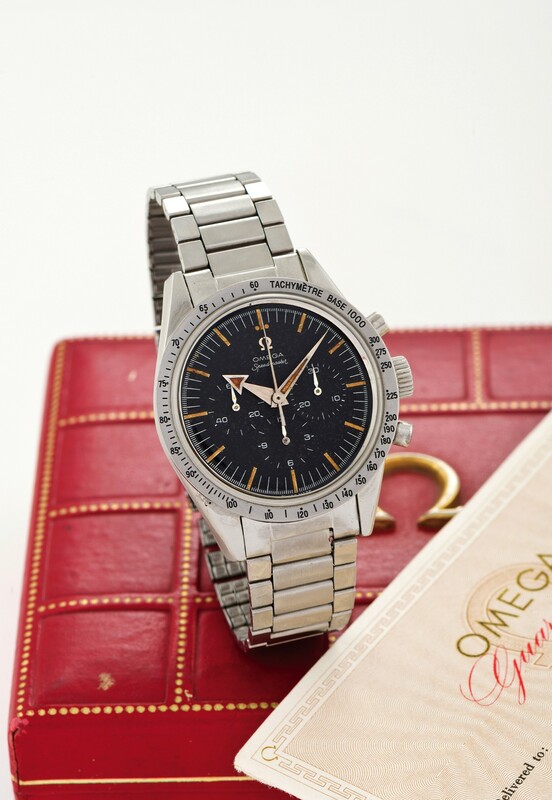 The last few days we’re exceedingly exciting for those of us following the auction world. 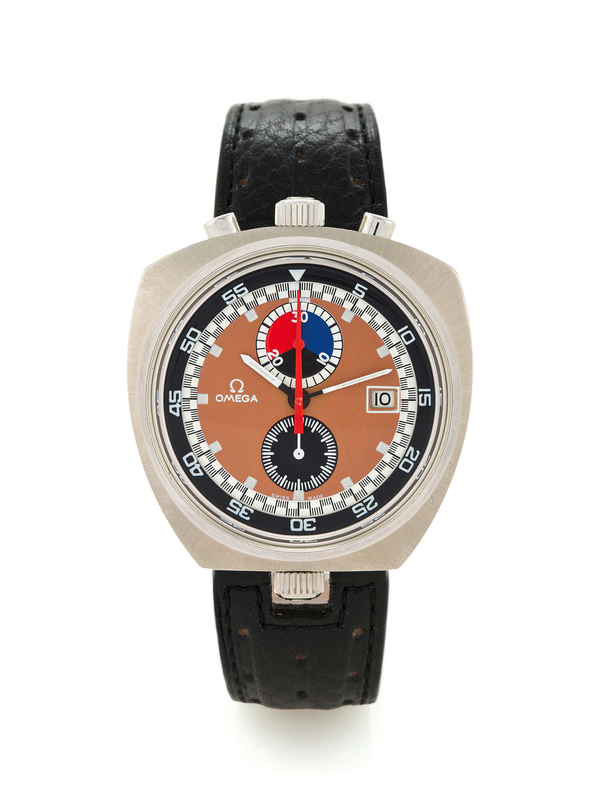 Christie’s held the spectacular Rolex Daytona ‘Lesson 1’ auction on November 10 while Antiquorum hosted the Important Modern & Vintage Timepieces the same day, followed by Important Watches by again Christie’s the day after. 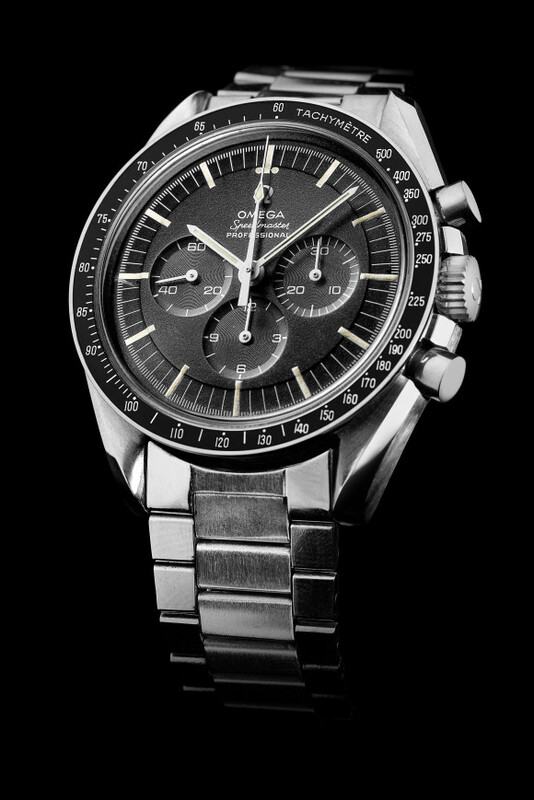 While the focus of the haute vintage collectors is still mainly Rolex and Patek Philippe, we thought it’d be fun to run past a few Speedmaster-related results.. Enjoy the show! 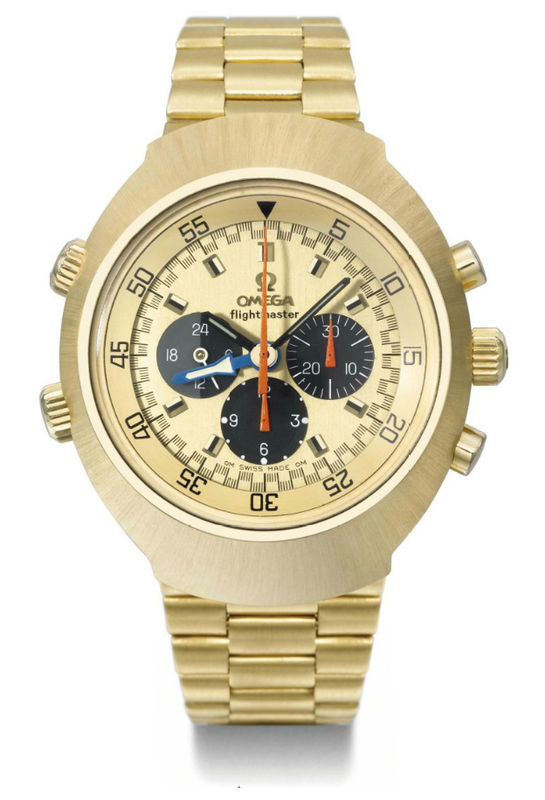 The Flightmaster is a stunning watch in any disguise, but the crown is of course reserved for the full-gold model. The hammer price, excluding fees and taxes, for this particular model was CHF 30,000, which seems rather reasonable. 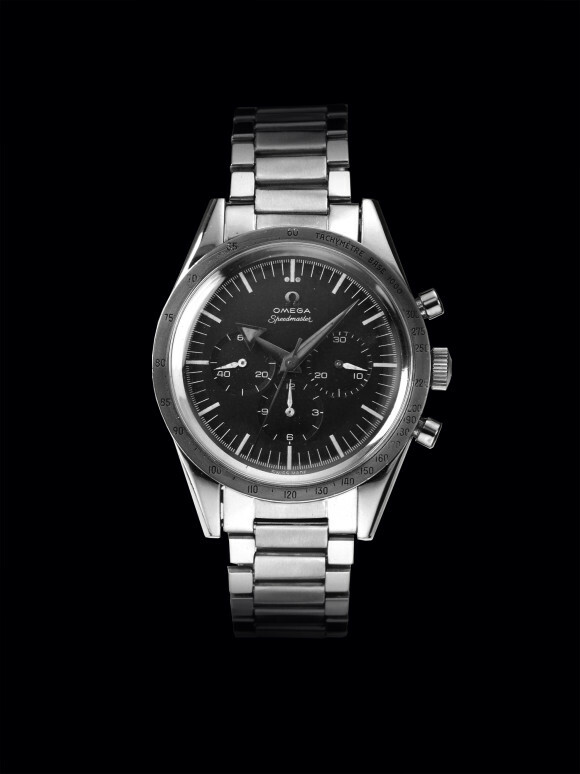 FYI – a boxed&papered model in the 2007 OmegaMania auction commanded almost CHF 50,000. The price realized was right in the centre of the 20-40K CHF estimate. 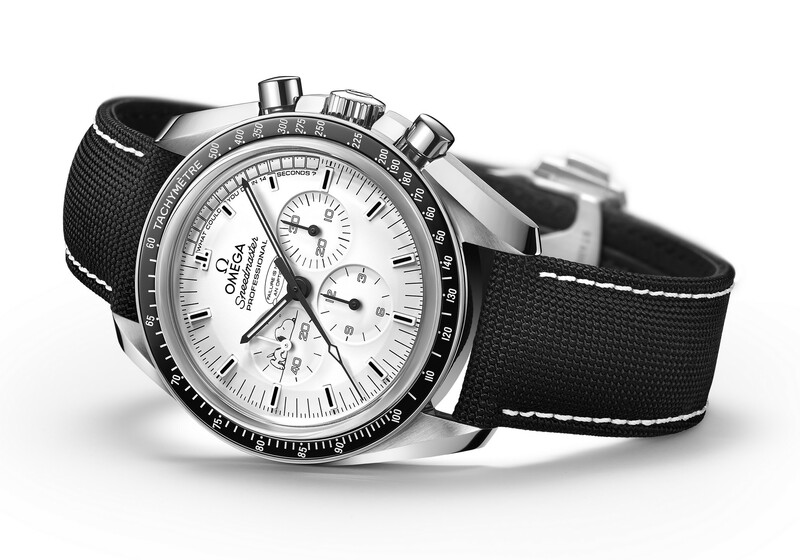 Sure – the Bullhead is no Speedmaster.. 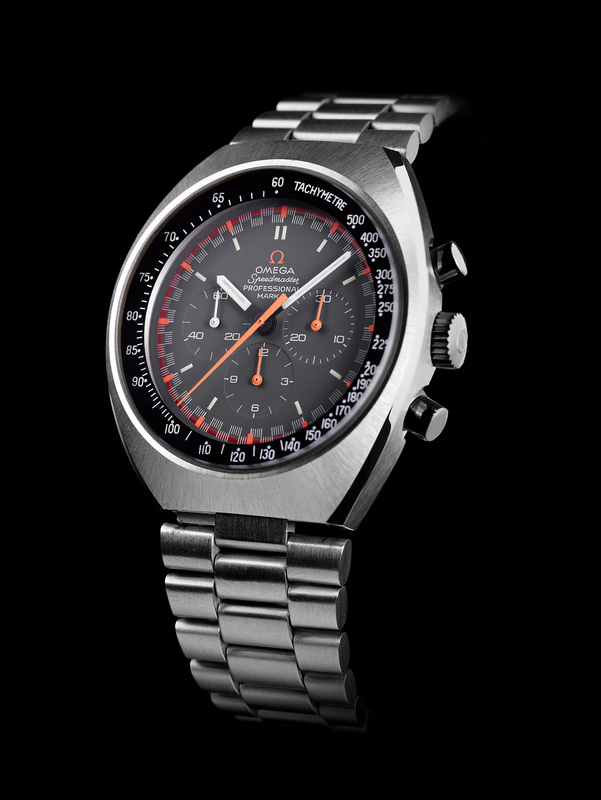 But then again, it is one of the more intriguing chronograph designs Omega has presented us.. Breathing the spirit of the late sixties / early seventies. The example above was hammered off at CHF 5,650. For our frequent visitors it shouldn’t come as a surprise: the Italia is one of our favourite Speedies. The off-white dial is such a joy! 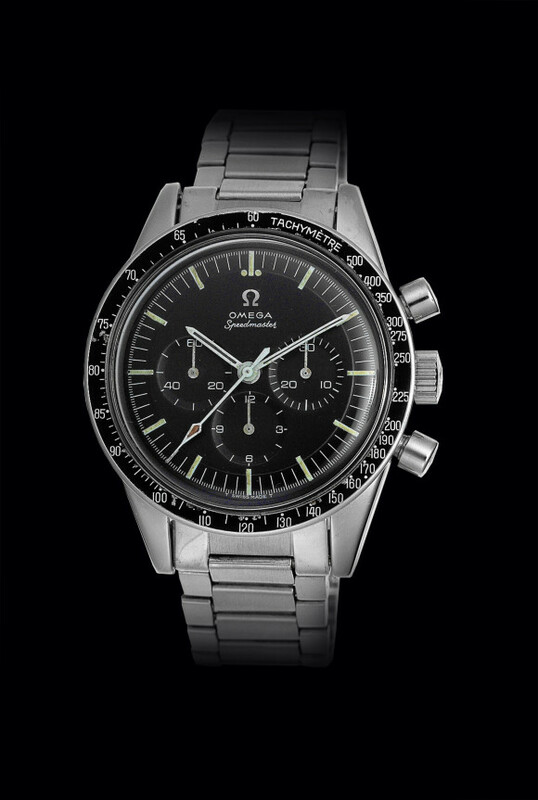 This example, with box and papers, reached a respectable CHF 6,250 – not bad for a 15 year old Speedmaster! 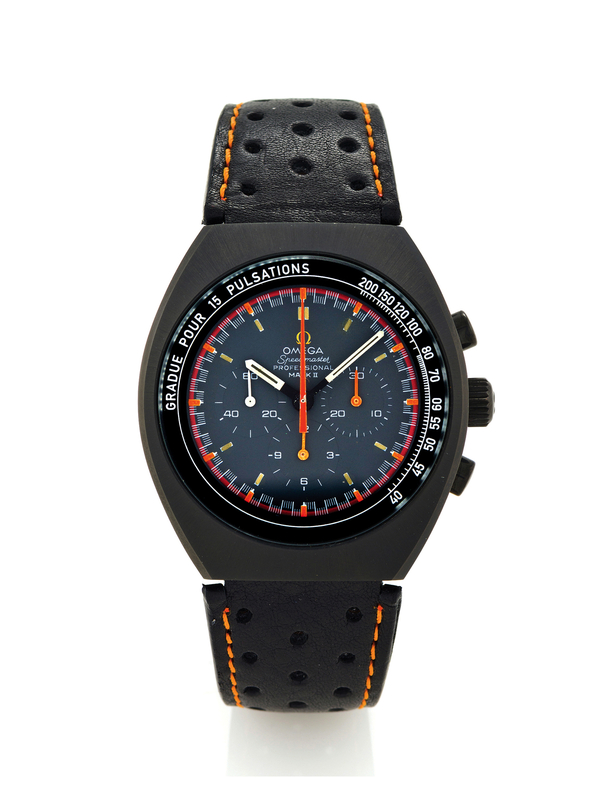 Now for the weird and wonderful: a Speedmaster Mark II ‘Racing’ with PVD-coated case and somewhat rare pulsation scale. 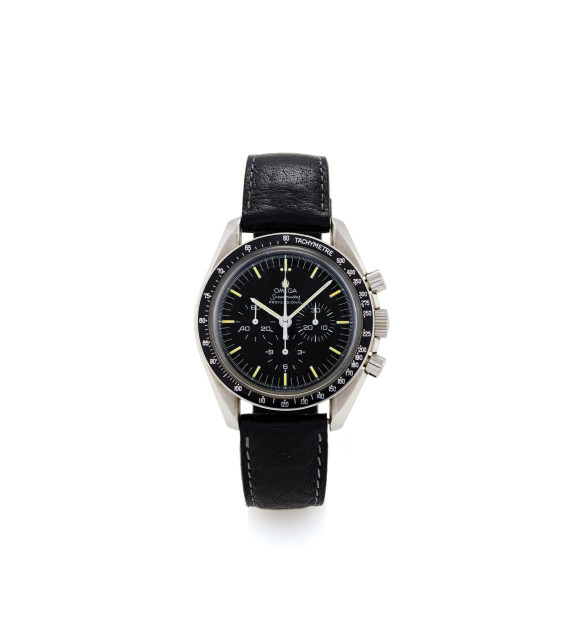 At CHF 4,000, it seems like a job well done for the seller.. although we have no idea of the original selling price of this Moontime custom, made as a ‘limited edition of 10 pieces circa 2010’. But wait – it doesn’t stop at a PVD-coated Mark II. Apparently, Moontime also made this 1957 Replica.. 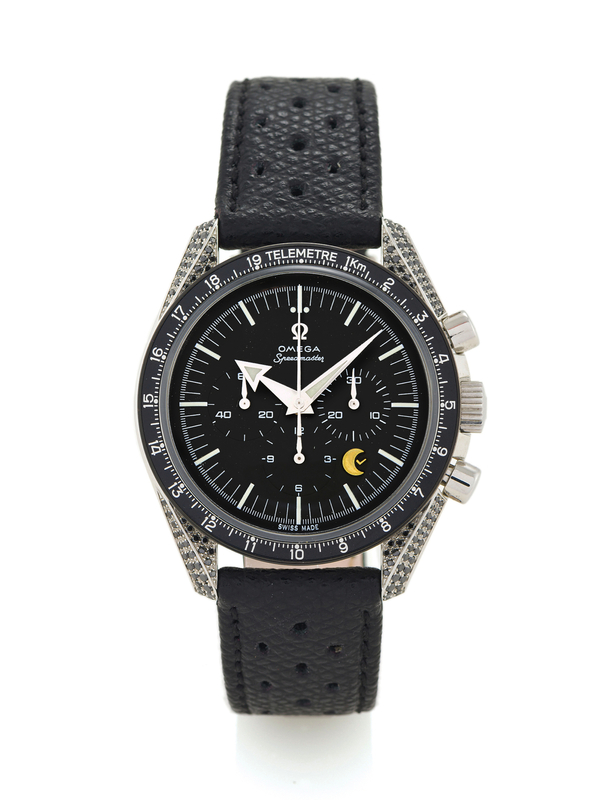 While the customized dial is acceptable and the telemeter bezel is a cool touch, we’re not so sure about the case set with black diamonds.. 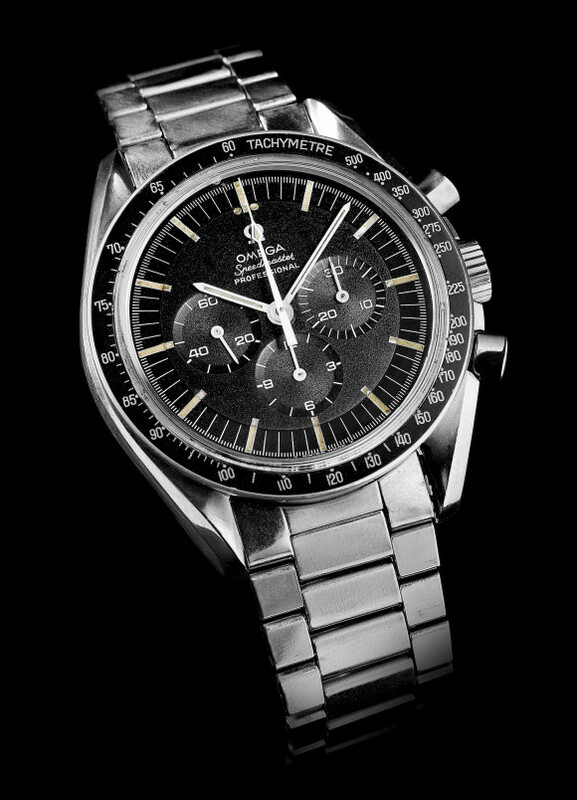 Still, sold at CHF 5,000! 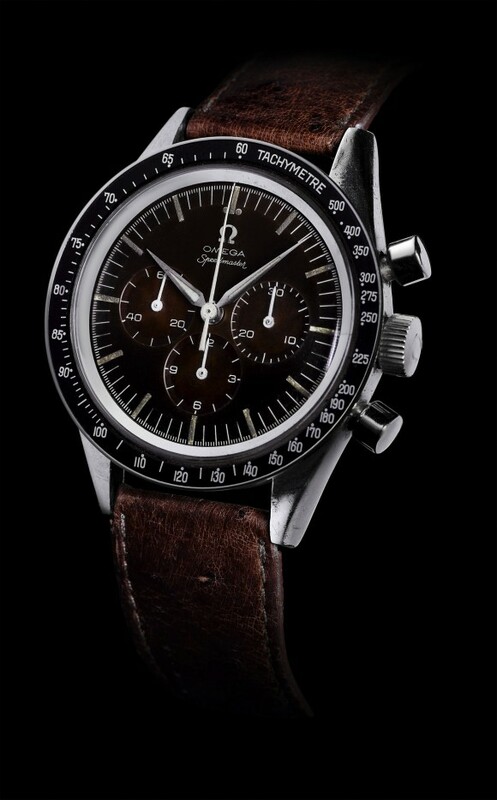 FYI, the following lot, a standard 1957, was sold at CHF 2,250…. Back to business – the subzero CK2915-2. 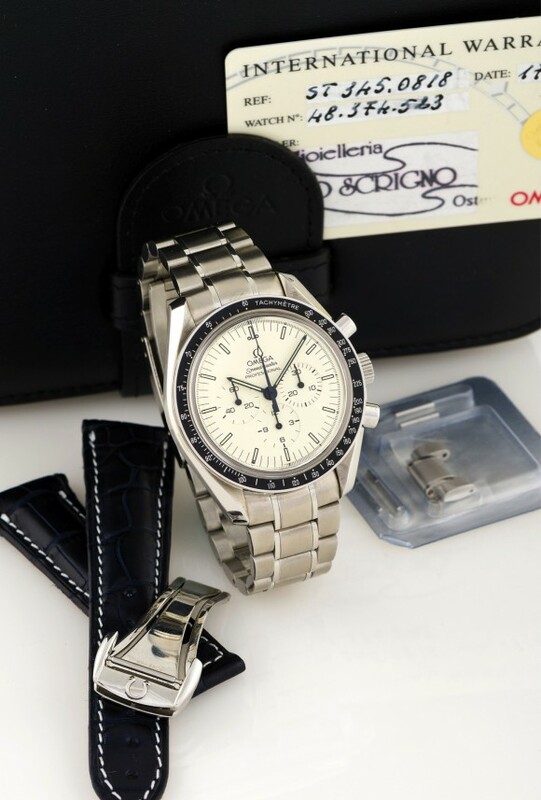 At CHF 27,500 a seemingly good buy.. Although we’ll have to report back later this week on the originality of the parts – if time permits. And we’re back to the Bullhead. 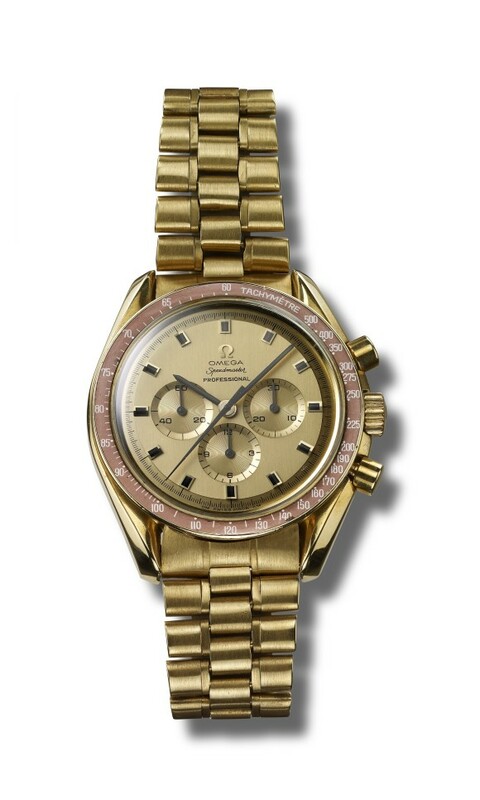 While the first example we showed was sold at CHF 5,650, this one, in notable better condition, reached CHF 8,125. Condition is King – especially if you’re in the game for the long run! Of course, the best is saved for last.. What may seem an ordinary Speedmaster Professional, is actually the ‘The only watch ever to spend extended time in open space’. This Speedmaster, made in 1988, was worn by Anatoly Artsebarsky during his 1991 Soyuz TM-12 mission. Not only was it worn in space for 144 days, 15 minutes and 21 seconds, it was worn in OPEN space on 6 ‘space walks’, for a total of approximately 33 hours. `Flown` Omega Speedmasters – watches that have actually been worn in space- are quite naturally the most coveted and desirable of all the Speedmasters and almost never reach the open market. 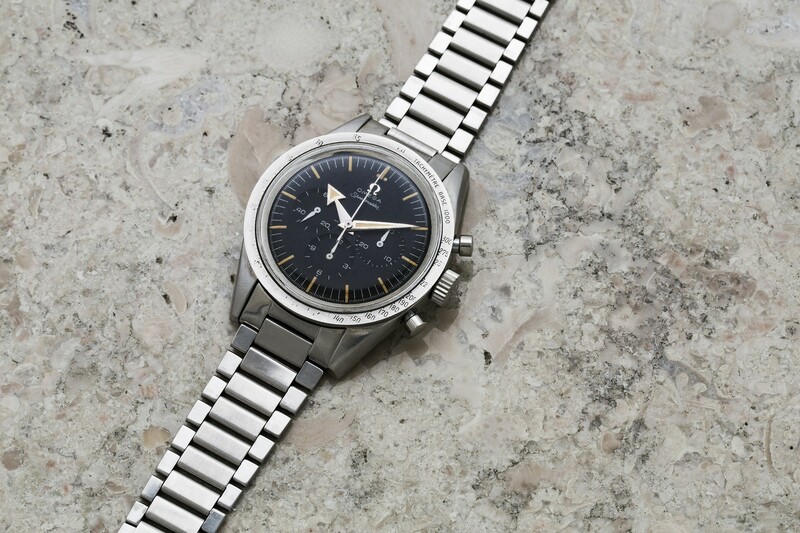 This historic watch, No. 48261214, once owned by the Ukrainian-born Russian cosmonaut Anatoly Artsebarsky is one of the very few Omega Speedmasters in private hands to have actually been worn in space and of all the `flown` Speedmasters no other watch has ever spent so many hours in open space – a total of 33 hours. 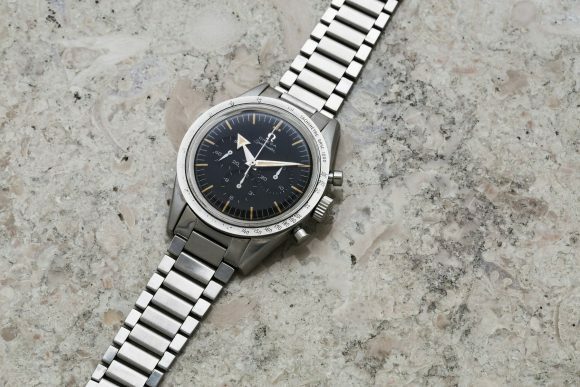 It is therefore not only an extremely significant watch in the history of the Omega Speedmaster but a uniquely historic world-class object in its own right. 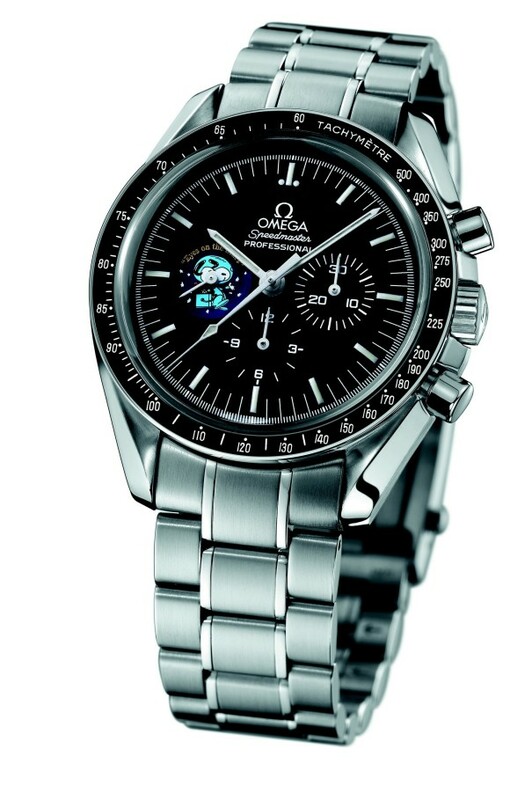 The provenance is verified by the accompanying certificate signed by Anatoly Artsebarsky. 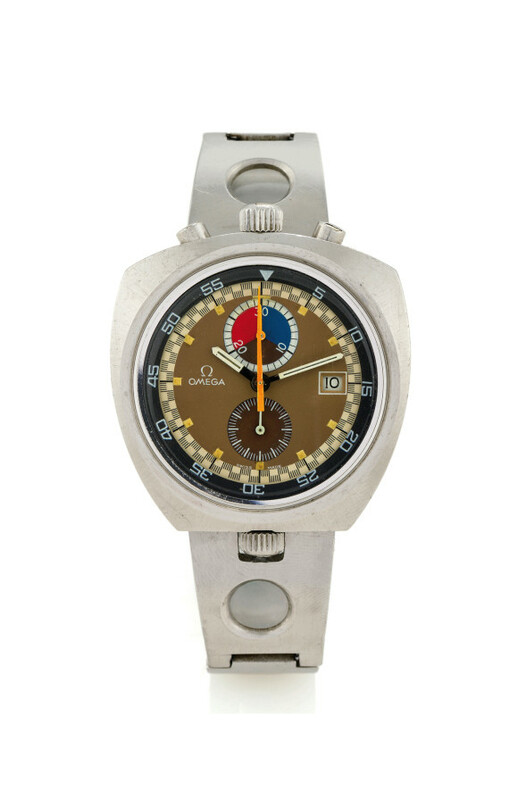 Artsebarsky spent five months on the MIR Space Station in 1991 and during that mission he made an unprecedented six ‘walks’ into open space, during each of those EVAs (extra-vehicular activities) he wore this watch. Artsebarsky was born in the Ukraine in 1956 and became a cosmonaut in 1985. In 1991 he was the 35-year-old Commander of Soyuz TM-12, leading the first joint Russian-British space mission and had the first Briton in space (Helen Sharman) along with Russian Sergei Krikalev, as fellow crew. To this day, Krikalev holds the record for most hours spent in space. Setting off on 18th May 1991 from the same pad that launched Yuri Gagarin some thirty years before, TM-12’s mission was to dock with the Mir space station, relieve the station crew and then spend the next five months constructing a space tower for use with the control module. On 26th May, a few days after docking with the Mir space station, the rest of the crew flew back to Earth leaving Artsebarsky and Krikalev onboard with a list of repairs and projects, including the tower construction. After over 145 days in space and six EVAs, Artsebarsky made his return and was immediately made a hero of the Soviet Union and given the Order of Lenin (among the last ever such award given), as well as being made a Pilot-Cosmonaut of the USSR and receiving the Medal for Merit in Space Exploration. While he was in orbit, the failed coup d’etat against Mikhail Gorbachev rocked the Soviet Union, setting in motion events which led to the end of the Soviet Union on January 1, 1992. Create your own vintage with the 3570.50.00! 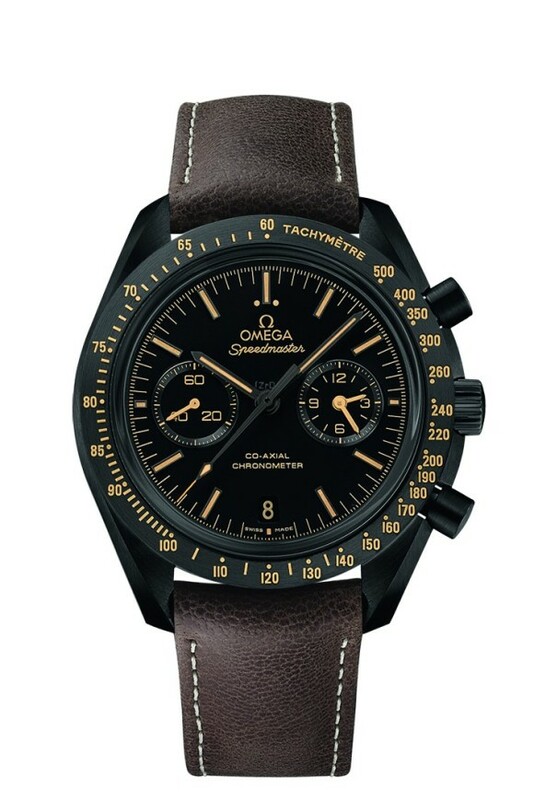 This entry was posted in Editorial, Speedmaster Professional and tagged 3593.20.00, Anatoly Artsebarsky, BA 345.0801, Bullhead, CK2915, Flightmaster, Mark 2, Moontime, PVD, Racing, ST 146.011 on November 12, 2013 by Dale Vito.